Rush will premiere their 40th anniversary tour documentary, “Time Stand Still”, in cinemas on November 3 ahead of its release on DVD and Blu-ray on November 18. Last year, Rush went out for a 40th-anniversary tour, rumored to be the last tour of its kind and the end of their life on the road. 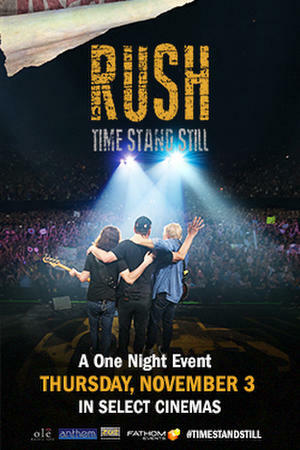 Named after a track from 1987’s “Hold Your Fire” and narrated by Paul Rudd, "Rush: Time Stand Still" is a documentary that covers the "R40" tour and the unique relationship Rush have with their devoted fans. Personal stories highlight the importance Rush holds in their lives and the lasting impressions of their extensive catalog. For Rush, they are quick to acknowledge the role their fans have played in their success, which made this tour so difficult. Candid interviews with Geddy Lee, Alex Lifeson and Neil Peart and exclusive behind-the-scenes footage provide the raw and emotional undertones of this feature-length film. Fathom Events will screen “Time Stand Still” in over 460 theaters, with the main feature accompanied by an exclusive 20-minute short film "Rush: A Salute To Kings." The short presents fellow rockers like Red Hot Chili Peppers drummer Chad Smith, Kiss' Gene Simmons, Heart's Wilson sisters, Foo Fighters' Taylor Hawkins and more sharing their thoughts on Rush and their storied career. Rush performed the final show of their 40th anniversary R40 Live tour at The Forum in Los Angeles on August 1, 2015, calling the trek their final large scale tour, with plans for the future still to be determined.